Made in continuous rounds without turning and weaving in loose ends of yarn as you go. With color 1 make a magic circle, using 4.00mm hook (RS) ch1, 8sc in circle, close circle pulling loose thread, sl st to first sc on beginning of row. 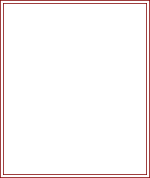 Round 4 - Join in color 3 with a sl st to any space between shell groups, work * 8trc in next ch2 space, sl st in space between next 2 shell groups, * rpt from * to * to end, sl st to sl st on beginning of row. Do Not Fasten off. 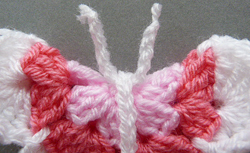 Fold butterfly in half, wrap ch around the middle of wings, (see pic) sl st to first ch. Fasten off. Antenna - ch10. Fasten off. Finishing - Weave in loose end of yarn from body and trim, slide antenna under body ch (see pic) trim leaving a small tail on each. 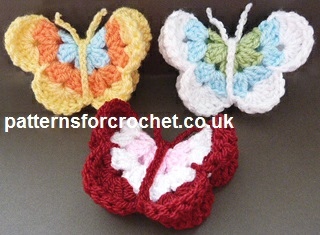 Hope you enjoy this free crochet pattern for a butterfly motif.